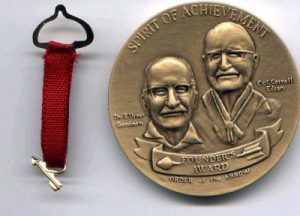 With the death of Dr. E. Urner Goodman on March 13, 1980, the National Order of the Arrow Committee decided in 1981 to create the Founder’s Award as a tribute to the Order’s founders. Unlike most awards in Scouting, the Founder’s Award has no criteria set by the National Boy Scouts of America. Instead, each Lodge is expected to develop its own procedures for the awarding of this prestigious recognition. Therefore, the Founder’s Award has a unique meaning to each Lodge. However, one characteristic remains the same, only the most dedicated Arrowmen are considered for the award. It is only reserved for those Arrowmen who demonstrate and memorialize in their everyday life the spirit of achievement as described by our Founders, Dr. E. Urner Goodman and Carroll A. Edson. Our Lodge first presented the Founder’s Award in 1983, and the service rendered to Scouting by past, present, and future Founder’s Award recipients should encourage others to emulate their dedication to Atta Kulla Kulla Lodge and the Boy Scouts of America. Each recipient is presented with an official certificate approved and issued by the National Order of the Arrow Committee, a handsome bronze medallion bearing the likenesses of our Founders, and an Award ribbon that has a gold arrow suspended from a red ribbon. *Note: Dan Merritt received a plaque instead of the Founder’s Award. The Founder’s Award is only given to Brotherhood or Vigil Honor members. A plaque is given to Ordeal members.